I give a lot of quilts away -- a LOT of quilts. What else are quilts for? My daughter has made a very good friend at college and such a friend deserves a quilt! By all accounts, my gal's pal loved the quilt! This weekend I am teaching at Cottonseed Glory in Annapolis, Maryland. On my drive down, I stopped by Washington DC to see the cherry blossoms. They were beautiful! Here I am, rocking the wind-blown look, right across from the Jefferson Memorial. I visited the Freer and Sackler Galleries, and my head blew up from all of the loveliness. So much inspiration! I really need a month at home to just quilt. If you've ever wanted to check out QNNtv.com, it's free this weekend. (Hint: my episode of Quilt It! aired in January). I have subscribed to QNNtv.com for two years and find it a great value. They have so many quilt shows available, all for the cost of a single quilt book! Her table is larger than mine so it shouldn't cover her entire tabletop! * That post was from 2 1/2 years ago and she had 15 tablerunners then. She probably has nearly 30 now. I'll ask her to count again sometime. So, if you walk into my house and wonder why there is a crumply pizza box on the floor, it is because my cat has claimed it as his own. He's been using this box as his bed for over a month and it's getting that shabby chic look. Kermit weighs over 17 pounds and the box isn't meant for that type of abuse. Should I just throw it away? Last week I drove through Massachusetts and stopped at a cute new quilting shop: Sturbridge Quilting and Sewing Center. I am having so much fun teaching some wonderful quilters in Pelham, NH this weekend and got to spend some quilting time in my hotel room. Last fall I was in New Hampshire teaching longarm quilting by day but by night, my humble hotel room became my most divine sewing studio. I pieced the center of my latest quilt in that hotel room. I added the border when I got home and threw the top in the "to be quilted" pile. I basted this sweet thing on my longarm with a large loose meander, and then quilted it on my Sweet Sixteen. The basting worked beautifully. Not a single pucker on the quilt. I felt so smart! Then, I had to remove the basting. Hours days weeks later, I pulled out the last of the basting. I felt much less smart then, and my fingers hurt! What is your favorite basting method? It currently has no home, but I do have a few people in mind. I never thought that I would give up my straw needles, but these are now my favorites! Look for these needles, and look for my friend John's latest quilt design in the Summer Fons & Porter, coming to newsstands next week! They solve my thimble problem. Yes, I have had a thimble problem. If you see me at a quilt show (AQS Lancaster, MQX, MQS) with a little red dot on my finger, you will know that I have been appliqueing and forgot to take my "thimble" off! If you need a challenge this morning, take a photo of your right hand with a traditional camera. No, really, try it. It is not easy at all! Do you have a favorite product that I need to try? Or should I say Design Sofa Monday? I am traveling and took this photo on the sofa in my hotel room. I decided that I liked the 4-patch center and stitched it down. These blocks make great hand-sewing for travel, so expect more finished blocks in future posts. They are all made from scraps, so each block will be slightly different. It's the shirt I wear to the gym. It makes me laugh (the sayings on the shirt, not going to the gym). I can't believe that MQX is in about 4 weeks! 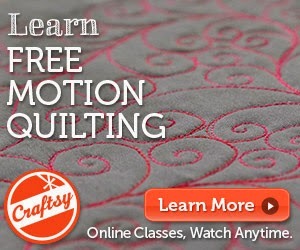 I will be teaching four classes there, including my new class, Quilting By Heart. I'm ready and excited to meet my students, and that is why I am at the gym every day -- just so I can keep up with them! Last week I had the honor of quilting a new sample for my friends at the Quilt Basket. This was an update of their wedding quilt with contemporary fabrics. It is challenging to finish quilts that are this lovely. I found myself continually patting and petting this quilt, crooning "my precious" when I should have been quilting it. The real danger of quilting shop samples is that it is a kind of "shop at home" experience. I quilt the quilt, I love the quilt, I buy the kit. It is as simple as 1-2-3. If you need to buy this kit (and you do! ), it is available here.